Will Smartphones come to dominate the mobile web? It’s interesting to see a recent consumer study of US mobile phone users which shows that 18.9% of mobile consumers now use a smartphone. 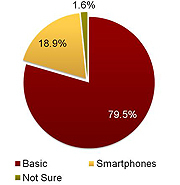 However, this research, conducted by The Kelsey Group with research partner ConStat and reported in Mobile Marketer, is at odds with Gartner research which reveals that in Q2 2008, 10.5% of all phones sold worldwide was a Smartphone. Of course, the Gartner figure is a global picture but would you expect the US figure to be almost double that of what you see around the world? True, US consumers generally have more disposable income and want to have their email on the move. It’s in the US that the iPhone has become the darling of the smartphone market, ahead of say Nokia’s N95 which is also a great smartphone. The N95 has sold particularly well in Europe but doesn’t quite have the same s*x appeal as the iPhone for US consumers. For the time being though smartphones don’t dominate the mobile web and anyone addressing an international market should bear in mind the current dominance of the mass market phones in comparison to smartphones. Take a look here at the top mobile devices we see here from users around the world surfing the mobile web. We believe the market is will gradually move up to more sophisticated smartphones in time. Do you have any thoughts on when you think they’ll come to dominate the mobile web? This entry was posted in mobile web and tagged iPhone, Kelsey Group, mobile web, smartphones, top mobile handsets. Bookmark the permalink.